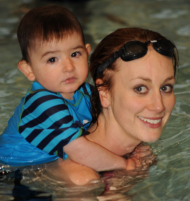 We want the learning to swim experience to be as enjoyable and trauma free for our kids as possible. This starts with teaching the kids to hold their breath and learn to respond to our trigger words in a way that is playful, but practical. Conditioning is a great way to start to get kids to understand their breath control which makes going under and building stamina a much smoother process.This is a fundamental technique we use in lessons that is easily practiced at home. – If bub is visibly upset, wait until they are happier or have calmed down before continuing conditioning. – Remember you only need to repeat the process 3 times each bath time, as they get used to it they will start to close their eyes and their mouths when you say it. – Even if you have a child that doesn’t like to go under, conditioning is still important as it prepares them for later down the track when they may decide going under is ok again! – Always remember to praise them and smile, the more fun you make it, the more fun it will be.